Freya is same with all heroes in mobile legends she has 4 skills. One of them is passive and the rest are casters. Her passive skill is Spirit Contact. She gets a shields, but only when she receives 2 hits. The next hit, will activate the shield and the enemies will receive damage. One of Freya’s cast is Wings of Faith. She jumps in a specific area you can target the place or automaticly, pulls the enemies closer and deals 240 physical dmg. Godspeed Strike is her next caster this is most powerfull skill. This spell increases her attack speed and movement speed. This works only for 3 hits. The last hit will stun the enemy in front of Freya and will deal 180 physical dmg so if possible try the first and second hit in bush, and then jump using first skill and hit and the enemy will stunned immediately . Her ult is Valkyrie. Freya becomes a Valkyrie, deals 360 dmg with increased armor, attack power and magical resistance. Here is the best way to use her skills: First use the Wings of Faith, then Godspeed Strike and her ultimate skill for last. In this order, all enemies will focus on her and she will definitely get a triple kill. But, to make it even easier, I have the perfect item build. You can check it out below. Demon’s Advent – Every hit by the enemies will reduce their attack power by 4%. A great item for Freya in each battle. This is my best way to play Freya. If you think and know any other good build, please let me know in the comments below and I will make sure to test it. 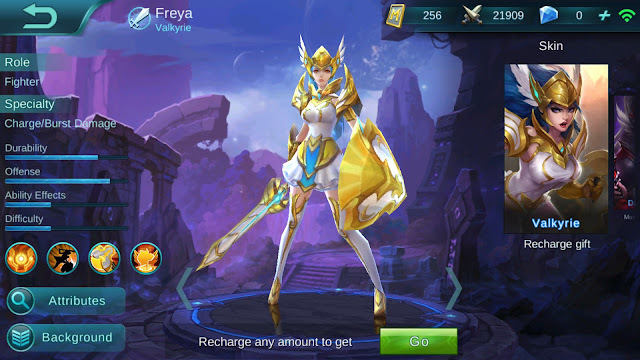 Have fun and enjoy playing Freya in MLBB. 0 Response to "Freya Best Build Mobile Legends"